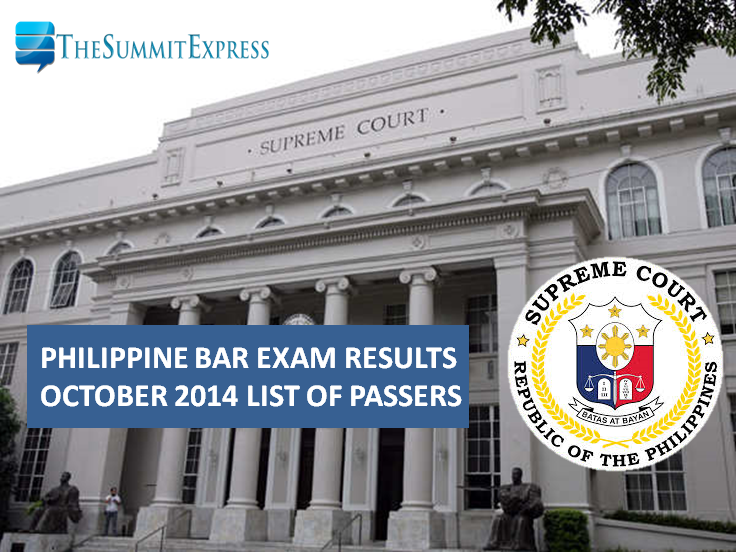 MANILA, Philippines - The Supreme Court (SC) releases results of October 2014 bar exam after the special en banc session on Thursday, March 26, 2015, the SC Public Information Office (SC-PIO) said as the much-awaited 'big day' for new Filipino lawyers is near. OFFICIAL: #BAR2014 results will be released Thursday March 26 after a special en Banc session at 930 AM. Last week, Assistant Court Administrator and SC-PIO Chief Theodore Te announced that results are not coming out on March 19 or 20 as some rumours said. "The date of the release of the bar examinations will be announced by the PIO, specifically ME AHEAD OF TIME so that those who wait can prepare. There has been, historically, a rush to file leaves at or near this time; similarly, churches of every denomination have also historically had better attendance also at or near this time," Te said. Te further said that the SC is currently undergoing the process to determine the exact release of results. "Unfortunately, there is a process that must be followed before we get to the release date--this involves an entire Office (that of the Bar Confidant) and eight examiners plus the Chairperson--and it is that process that we are undergoing right now." SC said that a total of 6,344 are confirmed bar candidates for the 113th bar exams. Only 5,994 examinees were able to finish the tests on the first and second Sundays of October 2014 at the University of Santo Tomas (UST) in Manila. Meanwhile, the actual count of examinees who have finished the third and fourth exams is not yet announced. The 2014 Philippine Bar exam, consists of eight law subjects covers 20% multiple choice questions and 80% essay-type questions same with the previous year examination structure. SC Justice Diosdado M. Peralta served as the chairman of the 2014 bar examinations committee. TheSummitExpress will upload on this website the official results once out. Like Us on Facebook or Follow Us on Twitter to receive more updates.